The Historic Vehicle Association (HVA) has announced that the 1968 Mustang Fastback, serial #8R02S125559 from the movie Bullitt (1968) was recorded as the 21st automobile on the National Historic Vehicle Register. This program is a partnership between the HVA and U.S. Department of the Interior, Historic American Engineering Record and the archives of the Library of Congress. Sean Kiernan of Nashville, Tennessee is the owner of the “Bullitt” car. 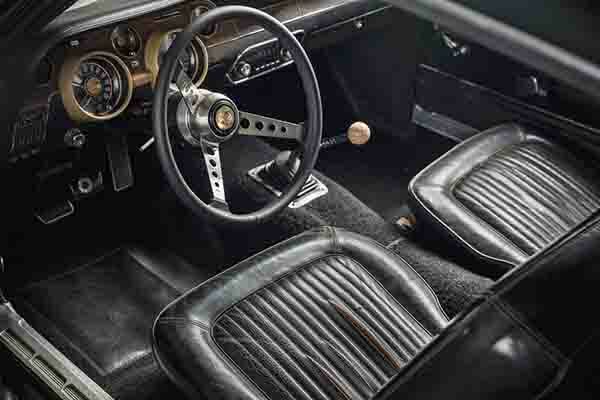 It was revealed to the public along with the new Ford Mustang Bullitt at the North American International Auto Show in Detroit in celebration of the 50th anniversary of the iconic movie. The movie Bullitt was the first film produced for Warner Brothers by Steve McQueen’s Solar Productions. Actor Steve McQueen, known for his love of motorcycles and fast cars, was hell-bent on bringing real action to the screen. He and Director Peter Yates succeeded with a visceral cop action flick set in San Francisco. The action was all real in Bullitt. Real speeds, real streets, with real crashes caught on film. The Kiernan’s ‘559 Mustang was the “hero car” used for many of McQueen’s close-up scenes. A second car (serial #8R02S125558) ‘558 Mustang was the “jump car” and was modified for many of the film’s stunt scenes. The 11-minute chase scene was the film’s core and forever changed Hollywood filmmaking. 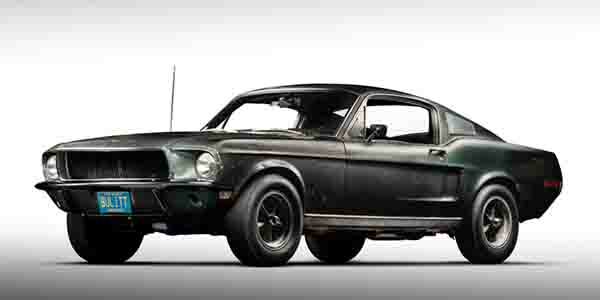 “The 1968 Ford Mustang Fastback (“Bullitt“) is associated with one of the most epic stars in film history and an automotive chase scene that helped propel McQueen to perpetual stardom. This was the moment when McQueen became “the king of cool.” It was the first movie he created on his own and had all the signature qualities for which he aspired. He played an understated cop, fighting the good fight, against all odds. What he needed was a car to complete his image to enhance his persona. 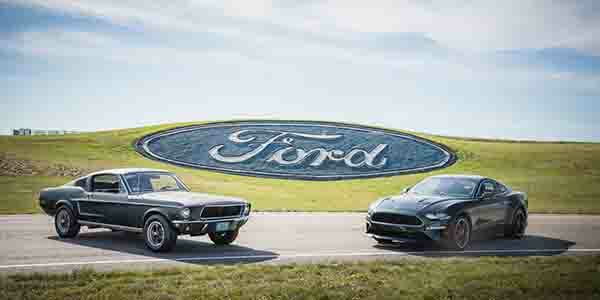 The 1968 Ford Mustang Fastback was just that car,” said Mark Gessler, President of the Historic Vehicle Association. The HVA’s historic documentation program of the 1968 Ford Mustang Fastback (“Bullitt“) has been underwritten in part through the generous support of Ford Motor Company, Hagerty, Shell, Pennzoil, LKQ Corporation, American Fuel and Petrochemical Manufacturers, and The NB Center for American Automotive Heritage. 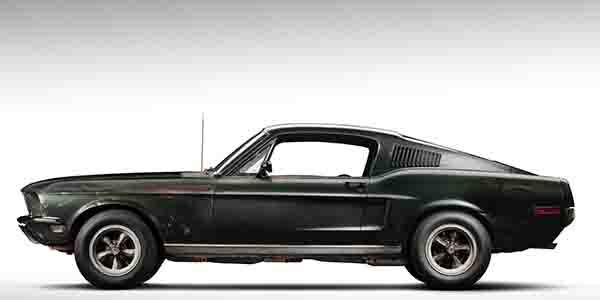 “For 44 years, our family has owned the Bullitt movie Mustang – serial number ‘559. There were two Bullitt movie cars. The ‘558 car was the heavily damaged “jump car” which was recently discovered in Mexico. Our ‘559 “hero car” was the vehicle that McQueen drove in many of the movie scenes. According to the New Jersey detective selling the car, my father – Robert Kiernan – was the only person that ever called. We’re not exactly sure how much dad paid but it was around $6,000. It was quite a bit of money back then for a used ’68 Mustang Fastback. In fact, it was about twice to four times the going-rate. Bullitt wasn’t a second car – it was their only car. Dad took the train every day to the World Trade Center where he worked in insurance. Mom drove Bullitt to St. Vincent’s parish where she taught third grade. The car was never modified – it has a straight exhaust and shook the pavement. God only knows what those kids must have thought. Mom must have been pretty cool. On weekends, it was the family car and was driven to Maine and upstate New York numerous times. It must have been deafening. There was no sound-proofing because it had been removed for the movie. The trunk had a huge cut-out for a smoke machine. When it rained, I have no idea how the luggage stayed dry. We recently discovered the rear seatbelts hidden with Gaffer’s Tape. I guess my sister Kelly was never buckled in. Dad installed a pair of speakers in the back that are still there. 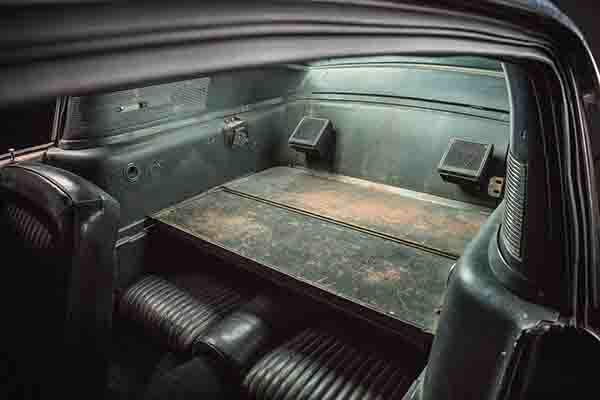 With no air-conditioning, windows rolled down and the blaring AM radio, those Bullitt road trips in the 1970s must have been thrilling. In 1977 my dad got a call from Steve McQueen. Steve had tracked down the prior owner, who gave him our phone number. McQueen wanted the car. He was a guy that was not used to hearing the word “no.” But my dad told him, “No thanks, we are not interested in selling.” McQueen followed up with a letter reiterating his interest, saying he wanted the car back and offered a trade or something as long as it wasn’t “too much money.” Dad never answered that letter. Bullitt was part of our family. I was born in 1981 – about the last time the Bullitt moved under its own power. Dad was an executive and had a company car. Mom was driving something more practical – a Plymouth Horizon – and I had a seat belt. Dad was always a car guy but by the 1980s another passion bit him – horses. Fast cars were moved to the sideline in favor of thoroughbreds. By the time we moved to our Kentucky farm outside of Cincinnati, we had a number of horses. Ultimately, the farm became a full-time job for all of us. Eventually I learned the story about our Bullitt Mustang. It was a car I would come to know well. While I’d never heard its cylinders fire, I pretended to drive it thousands of miles. I would hop in the seat, grab the steering wheel and run through the gears. I honestly have no idea how that Hurst shifter ever survived my daily abuse. 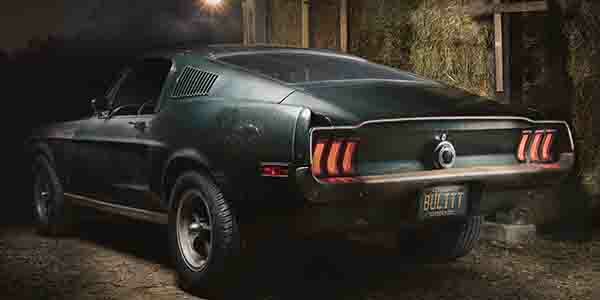 After Steve McQueen passed, hunting for the Bullitt Mustang intensified. While the car was decidedly not for sale, it simply became a project dad didn’t have time for. Gradually, it became our family secret out of necessity. Dad was now a busy executive with horse racing business interests, but he took quiet pride knowing the Bullitt was waiting in the garage. By 1995, we moved to a house on a smaller farm near Nashville. A few years later dad retired and started scaling back. I took a job in automotive refinishing. By the late 1990s my father and I started to talk about rebuilding Bullitt. We became further inspired when, in 2001, Ford launched its first anniversary Mustang Bullitt, which stirred up more talk of the whereabouts of our original car. When our father-son project finally started to gain momentum, illness struck – my father was diagnosed with Parkinson’s disease. For the next couple of years, we could talk about cars, but not accomplish much. In 2014, he passed away. It became a father-son project we were never able to finish together. Over the past two years, I’ve worked alone in that same garage to return Bullitt to the condition it was when it was my parent’s daily driver. The engine was rebuilt, aging carpets were replaced, and a new steering wheel added similar to the one used in the movie. Aside from that it is pretty much the way it was, with the evidence of our family road miles, and the gentle patina that comes from years of storage. The front bumper is new and so is the front valance. These were damaged when my grandfather backed into the car in the 1970s. No artificial “patina” has been added – all the new parts can be plainly identified. The car is honest and that’s the way I wanted it. Over the last 18 months, several experts were brought in to see the car. Mustang expert Kevin Marti was the first and he verified our Mustang as the ‘559 Bullitt movie car. McKeel Hagerty was contacted, as Hagerty insures the car. We can all be grateful that these documents will be archived in the Library of Congress so that future generations of Americans can see the car, just as it is today. Our family is honored that it is the 21st vehicle to be recorded under the program and the subject of an HVA documentary that they will release later in 2018. I know my dad would be proud. We contacted Ford early on, as that had been my father’s wish. Together with the HVA, we decided the best time to reveal the car would be to commemorate both the 50th anniversary of the year the car was produced, and the 50th anniversary of the Bullitt movie. I am grateful to my wife Samantha and my good friends Steve Forister, Steven Whitaker, Casey Wallace and Ken Horstman, because without their encouragement and support the car would not be here today. I’m also grateful to LKQ Corporation (where I’ve been employed for 10 years) for flexibility in 2018 to tour with the car. Both the ‘558 and ‘559 cars shared identical build specifications. Upon purchase, the cars were prepared by Max Balchowsky for the use in the Bullitt movie. These modifications included: Borg-Warner T-10 heavy- duty four-speed manual transmission, heavy- duty Borg-Warner clutch, 390 ci engine built by Balchowsky, milled heads, carburetor and distributor modification, 4:10 Positraction rear end, heavy-duty universal joints, 5-ton motor mounts, reinforced shock mounts, cross beam support bar, Helwig stabilizers front and rear, Koni shocks, heavy-duty coil springs, frame reinforcements, American Racing mag wheels, Dunlop 5:00 M-15 racing tires on the front, 5:75×10:40 15 Firestone GP Indy Tires on the rear, custom exhaust and a Shelby-type steering wheel. 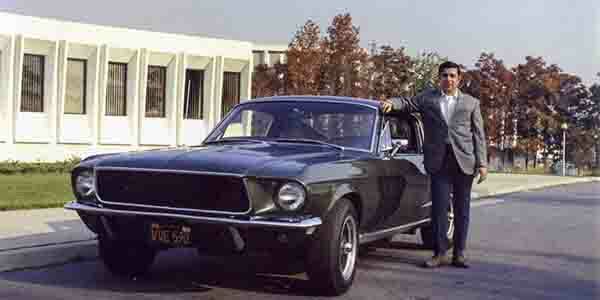 After filming, the “Bullitt” car was repaired and painted (Highland Green) for resale.